Red and leopard has always been one of my favorite combinations. I am not sure why, but I wear it without even realizing it! 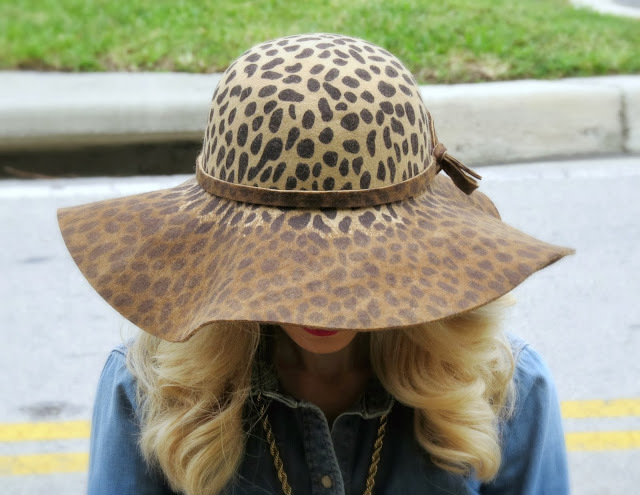 I posted this leopard hat from Elysian Boutique last week and I have been wearing it so much. I pretty much consider leopard to be a neutral, so I personally think that this hat goes with so much. And it is just a really fun piece to add a little something extra to any outfit. For a more casual look it would be so cute with skinny jeans, boots and a simple t-shirt. I couldn't agree more, leopard IS a neutral! Leopard is definitely a neutral :) I'm loving this red skirt though, it's so bright and cheery! I am obsessed with all things leopard. Love this look! So pretty! Love how you styled this look, that hat is so adorable!! You are always so put together! Hope you have a good day! I love the idea of wearing chambray with a pencil skirt! I have all these in my wardrobe so I will have to give it a try soon! Adorable style. Love this red stunning pencil skirt and that hat. OMG! This hat? Lalalove! And I agree, leopard is a neutral... and a staple in my wardrobe. I'm a leopard addict!! Love this entire look especially that hat and shoes!! This hat is so amazing and it looks so good on you! I would never take it off ha! I put leopard with anything and everything, I feel like you just can't go wrong!! Looking adorbs as usual, I can't get enough! You and you and your style are just too cute! You are beautiful, I'm your biggest fan.